South Philly’s Tony Luke Jr. is a cheesesteak legend turned Hollywood whiz kid. He laughs, holding out his hand to accept the illusory award and walks down the stairs of Tony Luke’s Beef and Beer Sports Bar on Front and Oregon streets in South Philadelphia. Downstairs, spring training baseball games and March Madness matchups come alive on the oversized flat screen TVs. Above the open kitchen, where the blades of beef slicers spin wildly and line cooks shout indecipherable orders, hangs a framed movie poster for The Nail: The Story of Joey Nardone featuring a photo of Luke and an unfamiliar young boy holding boxing gloves and standing toe to toe. A story of a Philadelphia boxer, The Nail features images of Rocky. But even with a friendly homage to the 1976 film – an exterior shot of Kensington and Allegheny avenues – the movie is a coming-of-age story and a love story of sorts. Joey “The Nail” Nardone, played by Luke, is a South Philadelphia classic – a kind-hearted, skin-headed, tattooed ex-boxer – who emerges from prison after an eight-year stint and befriends a 14-year-old Puerto Rican boy: his neighbor, Jesus. The Nail: The Story of Joey Nardone opened March 27 to a sold-out show at Rittenhouse Square’s Prince Music Theater (Courtesy phillycinefest.com). Joey’s discovery that Jesus’ father is physically abusive and his need to regain strength after his recent release from prison, spawn an impromptu boxing training in Joey’s ramshackle apartment. Taking on the role of a boxing Philadelphia ruffian isn’t as strange as it might seem for Luke, the Philadelphia cheesesteak icon. As an amateur kick boxer, Luke desired to turn pro and enlisted the help of a local kickboxing camp. Despite his legitimate size and drive, Luke’s fighting career was short-lived. On the first day of camp, the trainer asked him to fight the gym’s sweeper, who just began training. “He said, ‘If you promise not to hurt him, I’ll put him in the ring with you,’” Luke said. At this point, a much older Luke is throwing slow melodic punches into the air. “From the second the bell rang to when they picked me up off the canvas, he destroyed me unmercifully,” he said, laughing. If he wanted to be a fighter, he’d actually have to learn how to fight. “It discouraged me so much that I just stopped,” Luke said. 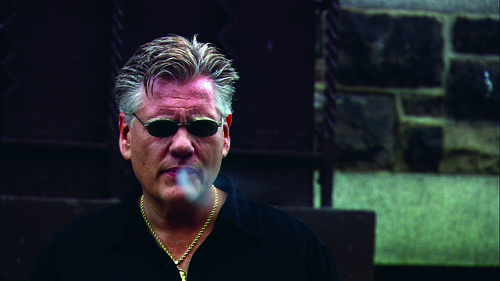 The character of Joey Nardone is not based on his own brief experience as a boxer, but rather on his own fight with good and evil on the streets of South Philadelphia. On the opposite side of Oregon Avenue sits the original Tony Luke’s Old Philly Style Sandwiches, radiating with neon lights and a chattering line out the door. The shop, despite its cheesesteak fame, didn’t even sell the iconic Philly sandwich when Luke and family opened the doors in 1992. “People were coming every day asking why we didn’t sell cheesesteaks, so we added one,” Luke said. Before working the sandwich shop in South Philadelphia, Luke, his brother Nicholas Lucidonio and father Anthony Lucidonio Sr. were involved in the food industry in their own capacities. But in 1992, the three joined culinary forces and opened Tony Luke’s Old Philly Style Sandwiches, almost building the shop by hand. It wasn’t always just cheesesteaks and boxing for Luke, though. The Nail star, who just turned 47 on March 12, had an acting itch first scratched by attending Philadelphia High School for Creative and Performing Arts and then by community theater forays, including a role as Harry the Werewolf in Dracula Baby at the Chestnut Street Theatre. Yet, it was Tony Luke’s Old Philly Style Sandwiches’ commercials on local television starring Luke that really catapulted his fame, especially with the local college crowd. The shop noticed an influx of younger customers and a cult following for the campy commercials. “At one of the colleges, in order to get into a fraternity, you had to come over to take a picture with me as part of the initiation,” he said with a smile. “Everybody loves Tony,” said James Quattrochi, director of The Nail . Quattrochi, a Los Angeles resident who grew up in Bronx, N.Y., didn’t know much of Luke’s cheesesteak fame when actor Leo Rossi called him a few years ago to ask if he wanted to be involved in the film written by Luke. “You want to make a movie with a guy who ran around in Invincible with a cape and tights?” Quattrochi said with a laugh, recalling his further interrogation of Rossi’s seemingly foolish request. It wasn’t until Quattrochi spoke on the phone with Luke that he discovered the request was not so foolish and fell victim to his undeniable charm. He agreed to take the helm of The Nail with Rossi as a co-star and producer. As Luke’s mentor and one of his closest friends, Rossi is an avid proponent of his acting ability. While it can be frustrating to Luke that his entrepreneurial cheesesteak venture and serious acting chops are indistinguishable to some, he said sometimes he can’t separate the two. Ultimately, balancing such a multifaceted life is no easy task. “I am absolutely a classic manic-depressive,” he said bluntly, standing up and slipping into an appropriately manic-depressive character. The animal can be tamed though, and Luke plans to use his ferocious success to champion causes, like The Nail ’s advocacy against child abuse. “To win the Academy Award of life, for me, is when I die, all those that came to see me will say, ‘My life was better for having known him,’” Luke said. Well, he sure made a hell of a cheesesteak. The Nail: The Story of Joey Nardone is currently playing at Philadelphia’s CineFest. Gabrielle DiPietro can be reached at gdipietro@temple.edu .